How to get 126% more leads using your blog? By Venessa Matthee blog, blogging, business, generated customer, good for your business, marketers, quality content Comments Off on How to get 126% more leads using your blog? “Blog” is an abbreviated version of “weblog,” which is a term used to describe websites that maintain an ongoing publishing of information. A blog features diary-type information and range from personal to business, and can focus on one subject or a whole range of subjects. Many blogs focus on a particular topics, such as web design, latest news, new offers, or mobile technology. Some are more eclectic, presenting links to all types of other sites. And others are more like personal journals, presenting the author’s daily life and thoughts. A main content area where latest newest is displayed. Often, the articles are organized into categories. Now that you know what a blog is how do you use it to grow your business and why is blogging good for your business? Some of you can be active bloggers but not getting any traction while others are not involved in writing and are thinking about jumping in. You may already be blogging for the company you work with or you are your own boss and have heard that blogging gets your brand noticed. Whichever camp you’re in, we are here to help you to follow your blogging dreams and keep on trucking. Below, we’ve pulled 3 compelling stats about the world of blogging. Here are 3 really good reasons why blogging is good for business. 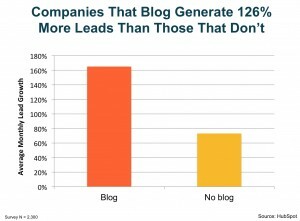 Companies that blog generate 126% more leads than those that don’t. 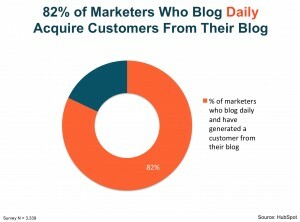 43% of marketers report that they have generated customers from their blog. 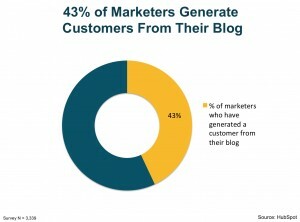 43% of marketers have generated customers from their blog. How did they do that? We believe that it’s because they know their target audience. Produce content for the right people and it will resonate with them and get them to take action. Especially if you are able to write to their knowledge level. Finding out the knowledge level of your audience is important because it considers how they like to read content. To learn more about writing to your audience, look out for our guide on Writing Quality Content. We will also share a few tips on our site to Boost Conversion Rates. Blogging daily makes a huge difference. Apparently an 82% difference. It’s not easy to blog every day, but it’s not impossible. With enormous value like this, how could you not want to try? Start with a list of topics you’d like to cover and plot them down in a calendar. Commit yourself to the deadlines and give yourself a 30-day challenge to make it fun. So there you have it: 3 reasons why blogging is good for your business, backed by stats. Can you think of other reasons why blogging is good for business? Send us an email! We’d love to hear from you.